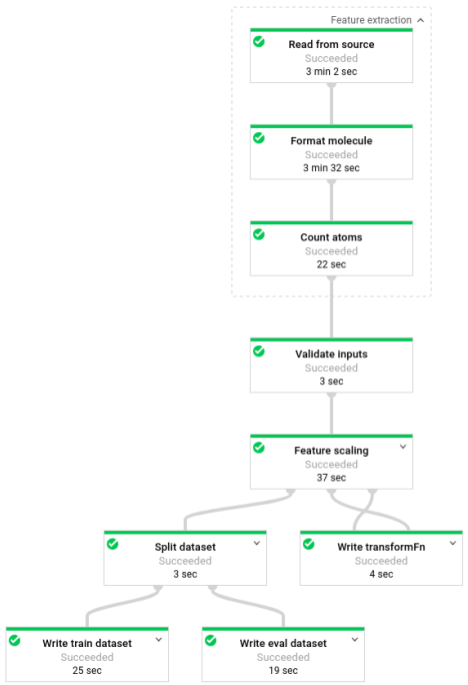 This walkthrough shows you how to preprocess, train, and make predictions on a machine learning model, using Apache Beam, Google Cloud Dataflow, and TensorFlow. To demonstrate these concepts, this walkthrough uses the Molecules code sample. Given molecular data as input, the Molecules code sample creates and trains a machine learning model to predict molecular energy. Note: The Molecules code sample uses the TensorFlow Estimators API. If you are using the TensorFlow Keras API but want your project to more closely match this walkthrough, you can convert your Keras model to an Estimator. The Molecules code sample extracts files that contain molecular data and counts the number of carbon, hydrogen, oxygen, and nitrogen atoms are in each molecule. Then, the code normalizes the counts to values between 0 and 1, and feeds the values into a TensorFlow Deep Neural Network estimator. The Neural Network estimator trains a machine learning model to predict molecular energy. 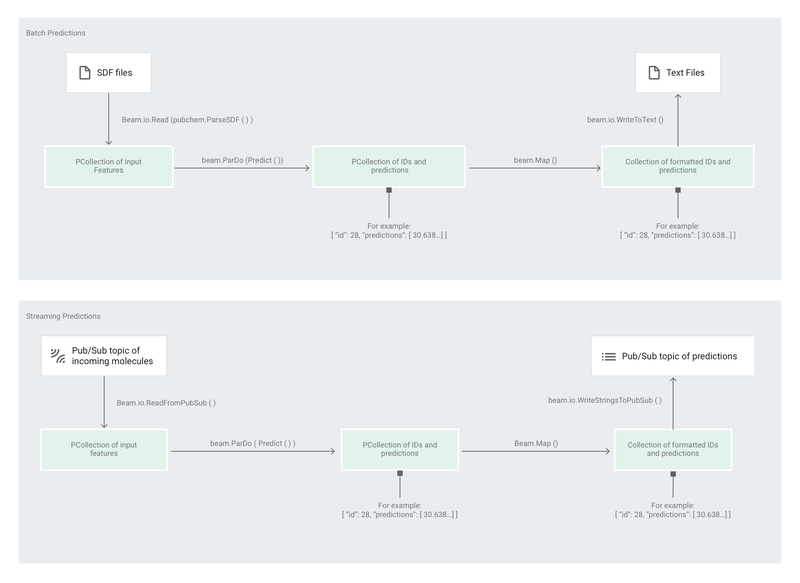 The sections below walk through the four phases, but this walkthrough focuses more on the phases that use Apache Beam and Cloud Dataflow: the preprocessing phase and the prediction phase. The preprocessing phase also uses the TensorFlow Transform library (commonly known as tf.Transform). The following image shows the workflow of the Molecules code sample. To set up your environment, follow the instructions in the README of the Molecules GitHub repository. Then, run the Molecules code sample using one of the provided wrapper scripts, run-local or run-cloud. These scripts automatically run all four phases of the code sample (extraction, preprocessing, training, and prediction). Alternatively, you can run each phase manually using the commands provided in the sections in this document. The output logs show you when the script runs each of the four phases (data extraction, preprocessing, training, and prediction). The data-extractor.py script has a required argument for the number of files. For ease of use, the run-local script and run-cloud scripts have a default of 5 files for this argument. Each file contains 25,000 molecules. Running the code sample should take approximately 3-7 minutes from start to finish. The time to run will vary depending on your computer’s CPU. Note: The run-local script includes optional arguments. See the README for information about how to use the optional arguments. To run the Molecules code sample on GCP, run the run-cloud wrapper script. All input files must be in Cloud Storage. Note: The run-cloud script includes optional arguments. See the README for information about how to use the optional arguments. The first step is to extract the input data. The data-extractor.py file extracts and decompresses the specified SDF files. In later steps, the example preprocesses these files and uses the data to train and evaluate the machine learning model. The file extracts the SDF files from the public source and stores them in a subdirectory inside the specified working directory. The default working directory (--work-dir) is /tmp/cloudml-samples/molecules. Note: Storing files in Cloud Storage incurs charges on your GCP project. See Cloud Storage pricing for more information. Reads and parses the extracted SDF files. Counts the number of different atoms in each of the molecules in the files. Normalizes the counts to values between 0 and 1 using tf.Transform. Partitions the dataset into a training dataset and an evaluation dataset. Writes the two datasets as TFRecord objects. Apache Beam transforms can efficiently manipulate single elements at a time, but transforms that require a full pass of the dataset cannot easily be done with only Apache Beam and are better done using tf.Transform. Because of this, the code uses Apache Beam transforms to read and format the molecules, and to count the atoms in each molecule. The code then uses tf.Transform to find the global minimum and maximum counts in order to normalize the data. The following image shows the steps in the pipeline. Note: Some of the logic in the preprocessing pipeline (preprocess.py) is shared with the pipeline responsible for making predictions (predict.py). To avoid code duplication, this shared logic is located in the pubchem/pipeline.py and pubchem/sdf.py files. Apache Beam’s pipeline dependency management encourages placing imported files in a separate module. The preprocess.py code creates an Apache Beam pipeline. Next, the code applies a feature_extraction transform to the pipeline. The pipeline uses SimpleFeatureExtraction as its feature_extraction transform. The SimpleFeatureExtraction transform, defined in pubchem/pipeline.py, contains a series of transforms that manipulate all elements independently. First, the code parses the molecules from the source file, then formats the molecules to a dictionary of molecule properties, and finally, counts the atoms in the molecule. These counts are the features (inputs) for the machine learning model. """The feature extraction (element-wise transformations). transformations that can be applied to any other pipeline as a step. # files, but the source could be any Apache Beam source. The read transform beam.io.Read(pubchem.ParseSDF(data_files_pattern)) reads SDF files from a custom source. The custom source, called ParseSDF, is defined in pubchem/pipeline.py. ParseSDF extends FileBasedSource and implements the read_records function that opens the extracted SDF files. When you run the Molecules code sample on GCP, multiple workers (VMs) can simultaneously read the files. To ensure that no two workers read the same content in the files, each file uses a range_tracker. The pipeline groups the raw data into sections of relevant information needed for the next steps. Each section in the parsed SDF file is stored in a dictionary (see pipeline/sdf.py), where the keys are the section names and the values are the raw line contents of the corresponding section. Note: The Molecules code sample extracts only a few of the molecules' features. To see a more complex feature extraction, see this project. The pipeline then validates the inputs. The ValidateInputData DoFn validates that every element matches the metadata given in the input_schema. This validation ensures that the data needs to look like when it’s fed into TensorFlow. The Molecules code sample uses a Deep Neural Network Regressor to make predictions. The general recommendation is to normalize the inputs before feeding them into the ML model. The pipeline uses tf.Transform to normalize the counts of each atom to values between 0 and 1. To read more about normalizing inputs, see feature scaling. Normalizing the values requires a full pass through the dataset, recording the minimum and maximum values. The code uses tf.Transform to go through the entire dataset and apply full-pass transforms. To use tf.Transform, the code must provide a function that contains the logic of the transform to perform on the dataset. In preprocess.py, the code uses the AnalyzeAndTransformDataset transform provided by tf.Transform. Learn more about how to use tf.Transform. In preprocess.py, the feature_scaling function used is normalize_inputs, which is defined in pubchem/pipeline.py. The function uses the tf.Transform function scale_to_0_1 to normalize the counts to values between 0 and 1. """Preprocessing function for tf.Transform (full-pass transformations). Here we will do any preprocessing that requires a full-pass of the dataset. maximum value of a certain field, creating a vocabulary for a string field. Normalizing the data manually is possible, but if the dataset is large, it’s faster to use Cloud Dataflow. Using Cloud Dataflow allows the pipeline to run on multiple workers (VMs) as necessary. Next, the preprocess.py pipeline partitions the single dataset into two datasets. It allocates approximately 80% of the data to be used as training data, and approximately 20% of the data to be used as evaluation data. Finally, the preprocess.py pipeline writes the two datasets (training and evaluation) using the WriteToTFRecord transform. Note: Running Cloud Dataflow pipelines incurs charges on your GCP project. See Cloud Dataflow pricing for more information. Recall that at the end of the preprocessing phase, the code split the data into two datasets (training and evaluation). The sample uses TensorFlow to train the machine learning model. The trainer/task.py file in the Molecules code sample contains the code for training the model. The main function of trainer/task.py loads the data that was processed in the preprocessing phase. The Estimator uses the training dataset to train the model, and then uses the evaluation dataset to verify that the model accurately predicts molecular energy given some of the molecule’s properties. Access the results in your browser at localhost:6006. Learn more about training an ML model. Note: Making predictions using AI Platform incurs charges on your GCP project. See AI Platform pricing for more information. After the Estimator trains the model, you can provide the model with inputs and it will make predictions. In the Molecules code sample, the pipeline in predict.py is responsible for making predictions. The pipeline can act as either a batch pipeline or a streaming pipeline. The code for the pipeline is the same for batch and streaming, except for the source and sink interactions. If the pipeline runs in batch mode, it reads the input files from the custom source and writes the output predictions as text files to the specified working directory. If the pipeline runs in streaming mode, it reads the input molecules, as they arrive, from a Cloud Pub/Sub topic. The pipeline writes the output predictions, as they are ready, to a different Cloud Pub/Sub topic. The following image shows the steps in the prediction pipelines (batch and streaming). The transform reads from the appropriate source based on the pipeline’s execution mode (batch or streaming), formats the molecules, and counts the different atoms in each molecule. Next, beam.ParDo(Predict(…)) is applied to the pipeline that performs the prediction of the molecular energy. Predict, the DoFn that's passed, uses the given dictionary of input features (atom counts), to predict the molecular energy. The next transform applied to the pipeline is beam.Map(lambda result: json.dumps(result)), which takes the prediction result dictionary and serializes it into a JSON string. Finally, the output is written to the sink (either as text files to the working directory for batch mode, or as messages published to a Cloud Pub/Sub topic for streaming mode). Batch predictions are optimized for throughput rather than latency. Batch predictions work best if you're making many predictions and you can wait for all of them to finish before getting the results. Streaming predictions are optimized for latency rather than throughput. Streaming predictions work best if you're making sporadic predictions but want to get the results as soon as possible. The prediction service (the streaming prediction pipeline) receives the input molecules from a Cloud Pub/Sub topic and publishes the output (predictions) to another Cloud Pub/Sub topic. After you have the prediction service (the streaming prediction pipeline) running, you need to run a publisher to send molecules to the prediction service and a subscriber to listen for prediction results. The Molecules code sample provides publisher (publisher.py) and subscriber (subscriber.py) services. The publisher parses SDF files from a directory and publishes them to the inputs topic. The subscriber listens for prediction results and logs them. For simplicity, this example uses the same SDF files used in the training phase. Note: You need to run these as different processes concurrently, so you'll need to have a different terminal to run each command. Remember to activate the virtualenv on each terminal. After the publisher starts parsing and publishing molecules, you'll start seeing predictions from the subscriber. After you've finished running the streaming predictions pipeline, stop your pipeline to prevent incurring charges.